The inescapable joy of the Christmas season bubbled over the Town of DeKalb at the annual Christmas tree lighting ceremony on Dec. 2. As the last song was concluding, Santa Claus arrived perfectly on time in the DeKalb Junction Volunteer Fire Department’s 78, and greeted all in attendance. 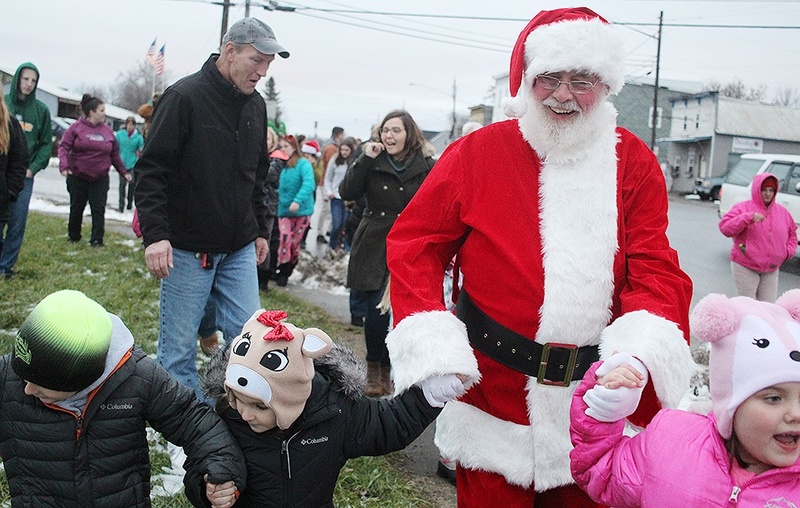 Town Supervisor John Frary greeted Santa Claus, welcoming him to the Town of DeKalb and invited the local children surrounding him to help Santa light the town Christmas tree. The countdown began, and soon the town Christmas tree was bathed in multi-colored lights that thrilled both the young and young-at-heart. Then taking the youths hands, Santa brought the local children over to the DeKalb Junction Fire Hall. All were invited to join the Hermon-DeKalb student choir in various Christmas carols. Refreshments were available, having been provided by the DeKalb Junction Volunteer Fire Department. And the local children had the opportunity to sit on Santa’s lap and tell him their Christmas wishes. Many bright smiles were seen and laughter were heard throughout the event as local residents got in the holiday spirit at this annual celebration.